Above measurement is measured by hand so it may have 1-3cm deviation (Any question, please consult with customer service) Please select the size based on your personal favor of clothes tightness. In hot summer, we should pay more attention to taking good care of our skins outdoors. Our team has most recently invented UPF40+ compression UV resistant cycling leg sleeves which provide sweet care to outdoor lovers like opening an umbrella for legs to resist UV invasion. These UPF40+ compression UV resistant leg sleeves select light thin fabrics, feel soft & cool with super air permeability and fit perfectly. They provide sweet care just like opening an umbrella for legs to resist UV invasion,2016 refreshing design with breathable and quick drying fabrics prevents mugginess and keeps cool feeling always for outdoor sports. 3D cutting perfect fits the body without constraint and tightness to make wearing more comfortable with great air permeability. The fabrics boost body surface thermal circulation, quicken moisture absorb and sweat releasing to make body refreshed. Meanwhile fabrics improve oxygen transportation ability of blood in sports to provide muscle group strength and reduce the possibility of strains and spasms. The imported nylon mesh cloth feels soft and is high air permeable which makes legs feel cooler. 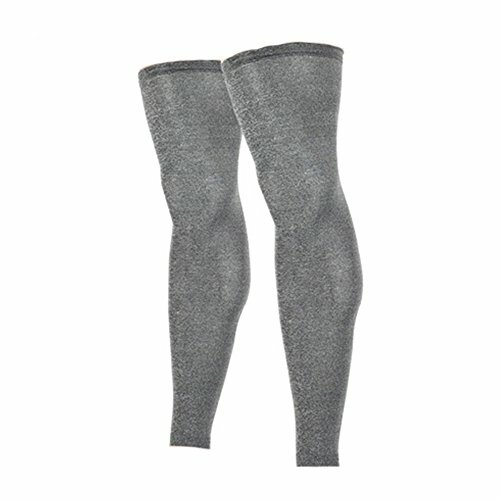 The well-tailored leg sleeves join together with four needles and six threads to make the modeling fashionable and smooth. The latest non-slip glue ribbons make wearing more convenient and perfect fit body. Material : Leg Sleeve;85% POLYESTER 15% SPANDEX"
Please check SIZE MEASUREMENT in the product description.There maybe 1-2 cm deviation in different sizes. If you have any questions about this product by V-SPORTS, contact us by completing and submitting the form below. If you are looking for a specif part number, please include it with your message.